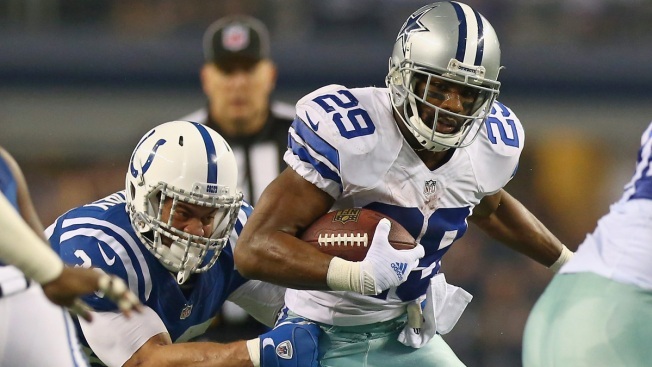 DeMarco Murray had his worst statistical game of the season on Sunday in the Cowboys' blowout win over the 10-win Colts to clinch the NFC East. No one will ever remember that fact. Murray had 21 carries in the game and gained just 58 yards — just the fourth time this season he hasn't eclipsed the 100-yard mark — but it was the fact Murray played in the game that people will remember for a long time. In a basically unprecedented move, Murray played after undergoing surgery to repair a broken hand just six days earlier. In fact, Murray still had stitches on the back of his hand. His hand was protected, and it was his non-carrying hand, but it was a hand with newly placed screws and stitches in it. Pretty much everyone who had suffered the injury and had surgery before him had missed at least a week. Not Murray. The fourth-year running back missed 11 games in his first three seasons and has dealt with durability questions throughout his career, going back to college at Oklahoma. This year, Murray has yet to miss a game, and he wanted to keep that streak going on Sunday. Head coach Jason Garrett said after the game he won't forget Murray's performance for a long time, and Murray's teammates also took notice. "I'm not going to lie, there was a lot of doubt," wide receiver Dez Bryant told reporters after the game. "He probably wasn't going to play. I'm his boy. I knew he was going to play, he's an animal, he's a beast. It's what beasts do. If you can walk and catch, then go. That's exactly what he does." Murray admitted to being in pain throughout the game, and it surely affected his performance. Now, he has a chance to rest next week against Washington with the NFC East wrapped up, and he should be good to go when the Cowboys open the playoffs. "It affected me a little bit, it was hurting throughout the game," Murray said. "But I made my mind up a long time ago that I was going to play. I was happy to be out there and happy to do whatever I can to help this team win and it's awesome with the win."